One of our customers has brought to our attention an issue that can arise when using an Mtronics sound card with a controller that has regenerative braking [all 4QD controllers]. The problem was that the sound card ceased working, the diagnosis was that that the information on the memory card may have been scrambled due to the regenerative braking causing an over voltage on the RPM information cables whilst the locos two 12v batteries were in a fully charged condition. 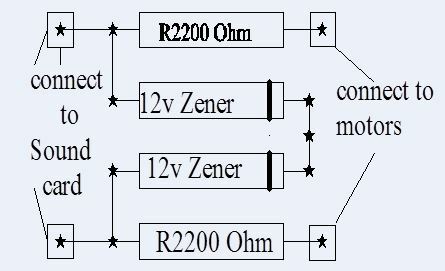 Mtroniks kindly provided this circuit diagram which provides protection to the sound cards 12V input in the event that regen braking takes the voltage above the safe limit. Please note: This is for information only, 4QD have not tested this circuit and can accept no responsibility for it.